“Actions” menu includes several actions which web part users can do. They are: “Refresh”, “Today”, “Scroll to Task”, “View Task”, “Edit Task”, “Outline”, “Delete Task”. When you need to refresh Resource Utilization chart to see, just got to “Actions – Refresh”. If you need to scroll chat view to current date, go to “Action – Today”. If you need to scroll chat view to a task, click task title on the left and then go to “Action – Scroll to Task”. You can also define which part of chart will be shown when you use scroll to task action (can be set in Gantt settings) – beginning of the view or middle part. 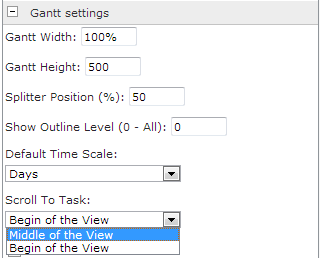 If you want to scroll chart to selected task and view its details, use “View Task” option in “Actions” menu. 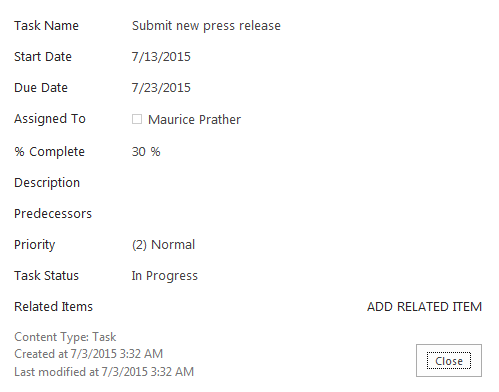 If you need to edit a task, just click on it and them go to “Actions” menu and choose “Edit Task” option. You will go to edit task page where you can make all the required modifications with this task. Define which outline level will be used for Resource management chart (“All subtasks”, “Outline Level 1”, “Outline Level 2”, “Outline Level 3”). 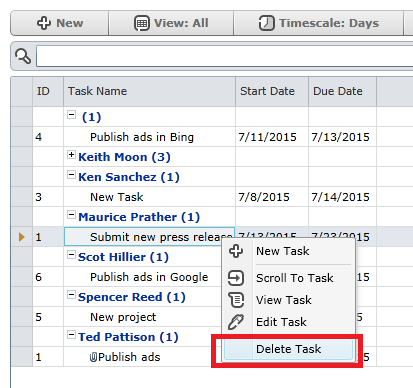 To delete a task from Resource Management chart, select it and choose “Actions – Delete Task”. 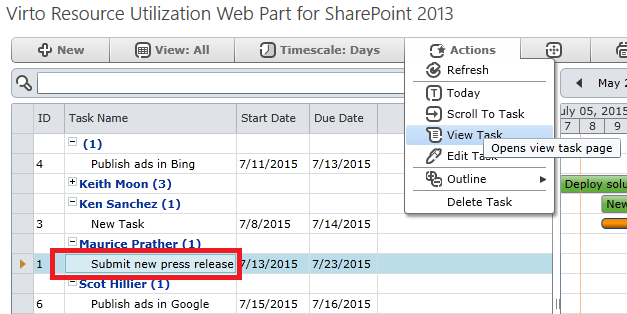 The same actions are available when you click a task and open context menu.